Creating a video to show case Glendale Community College’s (GCC) sustainability initiatives was a wonderful opportunity for the college and helped us realize that the holistic nature of all our efforts had truly led us to a culture of commitment to sustainability. Developing the video was fun and we relied heavily on student input. Students said “Deliver lots of information – six pieces per frame; use upbeat music instead of talking heads since interviews slow down presentation tempo and accents can impact audience reception; be colorful and visual.” We listened and chose a non-traditional format as a template. Use of this technique enabled us to show case over 30 ofGCC’s sustainability efforts in three short minutes of video. Many groups from across the college collaborated to create our video and the process has brought our GCC family closer. Also, our video is viewable from multiple places at the college and has increased college sustainability awareness and efforts. We will continue to use our video as a demonstration of the initiatives we are so proud of and as a marketing tool to inspire all stakeholders at GCC. As an academic medical center, SUNY Upstate Medical University faces unique sustainability challenges. A major portion of our mission is in direct patient care. Our hospitals and clinics account for 75% of the campus’ carbon footprint, and our Operating Rooms generate almost half of the institution’s solid waste. Upstate has responded to the challenge by implementing a variety of innovative sustainability initiatives while maintaining the highest levels of patient care, without compromising our academic and research missions. Our Central Sterile Process and Medical Device Re-Processing initiatives have reduced the use of costly polypropylene “blue wrap” by 23% and saved the University over $1 million during the last 20 months. We are proud of our efforts and look forward to continuing to set an example for other medical universities by delivering top notch training to heath care providers, providing exceptional patient care, and reducing our contribution to negative environmental impacts that deteriorate human health. 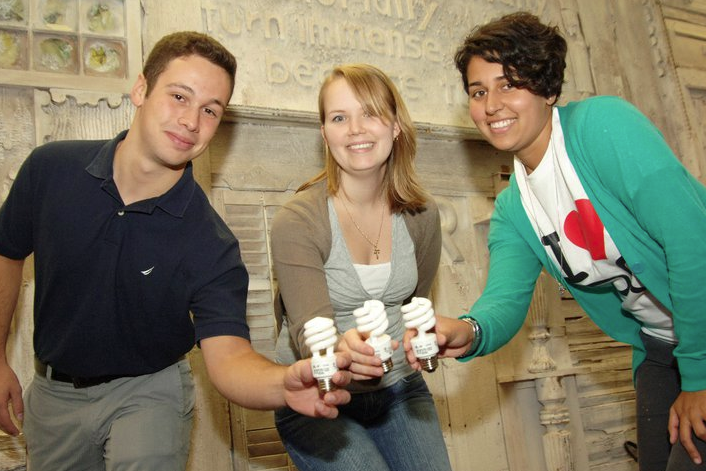 The University of Illinois Urbana Champaign (UIUC) Climate Action Plan (iCAP) has an energy reduction target of 20% by 2015. Conservation efforts have led to a 19% reduction to date! Our emissions reduction goal of 15% by 2015 has already been surpassed with a 16% reduction! And our water conservation reduction goal of 20% by 2015 has also been exceeded with a 16% reduction to date. Beyond operations we are also making an impact in preparing graduates for a changing global market place. Sustainability education can be found in more than 250 courses offered through 43 different departments on campus. The Office of Sustainability organizes an annual curriculum workshop. The instructors that have taken this workshop can reach 6,500 students per year. Creating our Climate Leadership Award video provided us the opportunity to tell our evolving and exciting story in a dynamic platform. We look forward to sharing the video with our many campus and community stakeholders. 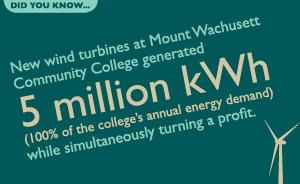 Sustainability at Allegheny College is a community endeavor. In collaboration with the American College & University Presidents’ Climate Commitment, we’ve pledged to achieve climate neutrality by 2020. To meet this goal we’ve integrated sustainability principles into budgets, daily operations, job descriptions, purchasing and contract policies, and our Strategic Plan. Students explore and advance sustainability in interdisciplinary courses, innovative research such as aquaponics and wind feasibility studies, collaborations with the City of Meadville and local schools, and extracurricular activities such as the annual October Energy Challenge and theTrashion Show. Creating a video to highlight our institution’s unique culture of sustainability as a finalist for Second Nature’s Climate Leadership Award was a rich and informative experience. Conversations with our president, senior staff, faculty and students revealed a consistent yet multifaceted appreciation of our current sustainability initiatives as well as a deep-rooted commitment to the practical approaches needed to support future efforts and to meet our climate neutrality goal. The Southwest Regional Collaborative Symposium – the second regionally focused conference hosted by Second Nature and the American College & University Presidents’ Climate Commitment – took place at Arizona State University in Tempe, Arizona March 1st- 2nd, 2012. ACUPCC Regional Symposiums focus on fostering collaboration among ACUPCC signatoriesfacing similar challenges and opportunities in their geographic regions. With attendance by 38 universities and organizations throughout the Southwest, participants sparked cross-institutional dialogue and solutions to Climate Action planning, curriculum reform, and other key issues. I consider it my civic duty to vote and my right as an individual to contribute from time to time to the campaigns of particular candidates, but I am typically reluctant to make public endorsements. Similarly I do not believe that I should be staking out through my public remarks Macalester’s position on health care reform or cap and trade or military intervention in Afghanistan. These are however precisely the issues that all of you should be studying, arguing about, and taking action on through your lives as students, scholars, and global citizens. My job is to ensure that Macalester provides the environment within which you can do these things, rather than to delineate in each instance the proper "Macalester" stance. On the other hand, I have spoken out both individually and on behalf of Macalester on issues including the importance of diversity to higher education and the necessity for all of us to practice and model environmental responsibility. For me, these issues are inseparable from and directly relevant to our work as a college and therefore ones that I can and should address. Some might contend that the latter topic is one that falls outside the standards I have defined; my response is that the reality of climate change has passed beyond the point of reasonable debate and has become an essential component of responsible citizenship, whose encouragement, at least at Macalester, lies at the core of our mission. Welcome to the February – March 2012 issue of the TCCPI Newsletter, an electronic update from the Tompkins County Climate Protection Initiative (TCCPI). 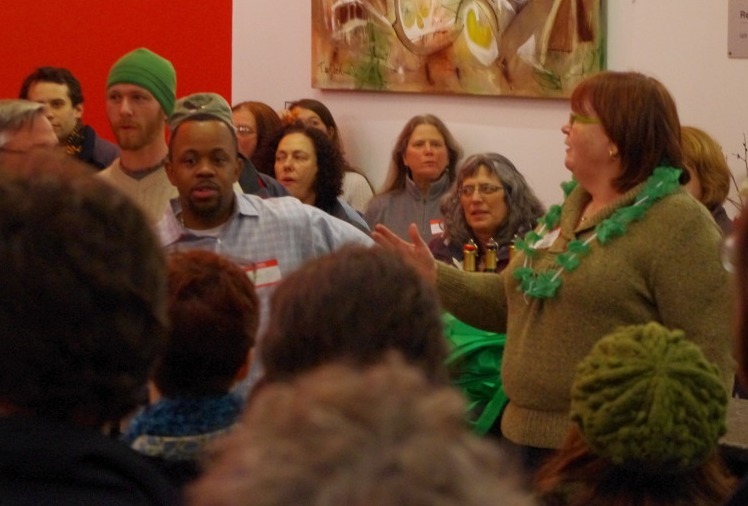 A coalition of over 70 local organizations officially kicked off the “Get Your GreenBack Tompkins” campaign at a public launch party on February 29 at the Kitchen Theatrein Ithaca, NY. The campaign aims to inspire all 42,000 households and every business in Tompkins County to take at least one new energy and money-saving step in their transportation, energy, waste, and food choices in the next year, saving money, creating jobs, and bringing the county closer to its goal of reducing carbon emissions 80% by 2050. Six years ago the University of Idaho established a student-run Sustainability Center (UISC), one of the few such campus centers in the western United States at that time. The University set a precedent for creating opportunities for students to learn sustainability practices by initiating research and projects which are a core component of the climate neutrality and sustainability education efforts of the university, and has shown the tangible benefits of financing student-innovations as a component of our broader strategic goals. Students are the epicenter of any college or university campus. They are the heart and soul and the reason why colleges and universities exist, and it would be a disservice to any campus if students were not engaged throughout all aspects of campus sustainability. A myriad of lessons have been learned from engaging an estimated 460,000 student leaders hailing from 2,000 campuses over Campus Ecology’s 23 years and counting of programming at the National Wildlife Federation (NWF). During this time, the program has also awarded approximately 180 Campus Ecology Fellowships to current undergraduate and graduate students and nearly 500 internships to recent graduates. Throughout the evolution of campus sustainability, there have been changes in approach and goals for greening one’s campus; however the one constant has always been student leadership. Since signing onto the President’s Climate Commitment in May 2008, UAlbany has implemented a series of initiatives designed to reduce its carbon footprint. While many colleges and universities focus efforts for sustainability in areas of recycling and waste reduction, the University at Albany has used students to focus on another wasted resource: energy. It is estimated that the United States could reduce its energy load 25% by simply implementing better energy practices. It is with that in mind that the “You’ve Got the Power to Conserve” energy program was created. Hundreds of light bulbs were purchased thanks to a grant from National Grid. These were distributed to students living in the residence halls. In the 2011-2012 academic year, faculty of the College of Liberal Arts (CLA) on Robert Morris University’s Assessment Committee determined that the university should assess our students for awareness of and engagement with sustainability in the same way that the university assesses all students for proficiencies in oral and written communication, quantitative analysis, leadership, and collaboration. Until that point, the university had assessed for cultural awareness, which incorporated diversity as a value prioritized by the university. The CLA decided that sustainability, as defined by environmental, economic, and social justice for this and future generations, should join diversity as an important part of Robert Morris University’s role in preparing students to not only be career holders in an economy, but to be participants in a democracy as sustainable citizens. In making these changes, Robert Morris University displays its commitment to the responsibility of higher education to not only prepare students for the workforce, but prepare them as local and global citizens. Because of its commitment to the ACUPCC, RMU has enthusiastically driven curricular change that prepares students to understand the interconnectedness between the individual, society, and the world, and, thus, to become a class of citizens capable of driving sustainability transformation in the future. The Climate Leadership Awards highlight campus innovation and climate leadership to transition society to a clean, just, and sustainable future, and are chosen fromACUPCC signatory institutions in good standing via a nomination process. This year marks the third annual Climate Leadership Awards, and Second Nature is proud to announce this year’s Finalists, who will advance on to be considered for a 2012 Award.